Estimated Sub-Lesson Length: 20 – 30 minutes | Complete the sub-lesson by filling in the blanks in the Digital Age College Planning Workbook and complete your final quiz! 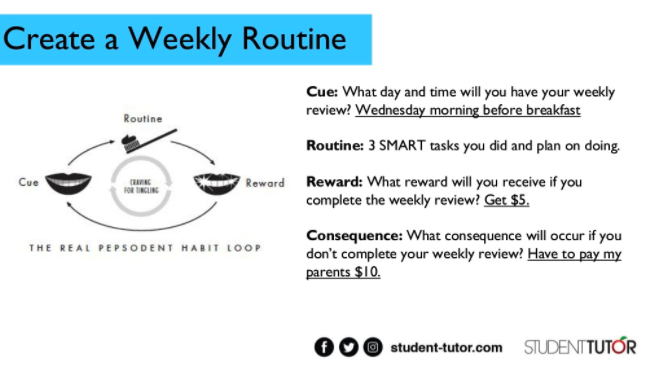 Now that we know what goals we need to obtain this semester (or summer), to get one step closer to achieving our 1-year and college goals, let’s create a weekly habit to ensure measurable progress is being made! Habits are a series of cues, routines, and rewards, so create a habit of having a weekly review session to ensure measurable progress is being made! After completing this sub-lesson in your workbook, complete the final quiz to earn your Digital Age College Planning badge! —Feeling overwhelmed with completing these lessons? Let us take away all present and future College stress by enrolling your student in our year-long mastermind program! We will ensure they take the RIGHT steps and keep you updated via our weekly emails, text messages, and quarterly online parent hangouts. Learn more by booking a time to speak with us.